How Do Titanium Wheelchairs Compare To Aluminum? The aluminum versus titanium situation is a debate that crops up in DME offices all the time – both types of materials have very dedicated fans. Is there really much of a difference? Shoppers and insurance companies alike are quick to notice the difference in price, that’s for sure. Why is there such a disparity? This quick guide will help you weigh the advantages and disadvantages of each option. Titanium is stronger than aluminum but that strength comes with a few drawbacks. Working titanium requires very expensive machinery and expert workmanship, leading to a higher production price and higher costs to repair. The good news is that scrapes and scratches buff right out of this hard-to-mar material. Your titanium chair could look new indefinitely. Aluminum can rival the strength of titanium given the right construction. Non-round extrusions are extremely popular because they give aluminum incredible strength without much increase in cost. This soft material is extremely easy to repair but will surely show signs of age as the paint and finish become worn. The good news is that paint is relatively cheap to replace. Strength is what gives titanium the weight advantage – titanium actually weighs more but manufacturers can use less of it, leading to lighter chairs overall. Of course, it’s important to remember that the structure of the chair still plays just as big a role in weight as the material. A well-constructed box-frame aluminum model might weigh less than the titanium equivalent. People who use a lot of options and accessories probably won’t notice a difference between light weight wheelchair models regardless of material. Most of the important hardware is available in titanium whether the chair is aluminum, carbon fiber, magnesium, etc. This is a good compromise for those who want the good value of aluminum without sacrificing the longevity of titanium. Structure and fit are always going to be the most important factors to decide the quality of ride. Nothing compares to a chair well built to your exact specifications, no matter the material. Of course, titanium is inherently flexible and tends to absorb more of the vibrations under ideal circumstances – just remember that you could probably find an aluminum chair that performs just as well at a lower price point. Price isn’t everything. 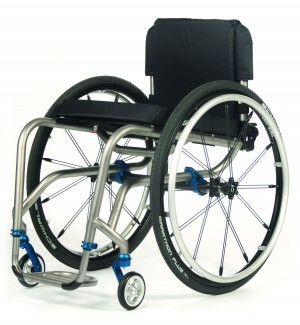 Titanium wheelchairs are a fantastic value for those who need the durability and lifelong appeal. Aluminum wheelchairs are the best value for those who want to make sure repairs and modifications are always easy to come by. The bottom line is that you do not need expensive materials to get a good ride or a good chair. Look for quality engineering and dedicated customer service first – a great company will treat their customers and their wheelchairs right, no matter the material. Find the wheelchair that you really want and give it a demo. You’ll fall in love with the ride and functionality, not with the frame materials or even the construction. The right chair is always more than just the sum of its parts. Natalie Sage is a freelance article writer that blog contributor! Natalie focuses on medical, health and self-development related topics to help keep everyone focused on maintaining a healthy lifestyle.